These two pillars are found on the coat of arms of the City of Cadiz which is the capital city of the province of Andalucia in Spain. In Figure 17 below, the so-called two “Pillars of Hercules” are shown on the “Coat of Arms of Cadiz”. They are also known as the Two Pillars of Melqart. They are also embedded in the flag of Spain. They are labelled with the writings of “PLUS” and “VLTRA” supposedly in Latin. As I see it, they represent two very important principles in the life of the ancient Turanian Tur/Turk/Oguz peoples and also in the present world of humanity. First, we will find out how they were identified in the ancient world. The motto “Plus Ultra” supposedly meant in Latin “further beyond”. Or alternatively, “Nec plus ultra” (Non plus ultra) meant "nothing further beyond". appear to have been concocted in order to hide away the ancient world civilization of Günhans. I explain their meanings below. WHAT WAS SAID ABOUTH THE PILLARS OF HERCULES OR THE PILLARS OF MELQART? The Pillars of Hercules (Latin: Columnae Herculis, Greek: Ἡράκλειοι Στῆλαι, Arabic: أعمدة هرقل‎, Spanish:Columnas de Hércules) was the phrase that was applied in Antiquity to the promontories that flank the entrance to the Strait of Gibraltar. The northern Pillar is the Rock of Gibraltar (now part of the British overseas territory of Gibraltar). A corresponding North African peak not being predominant, the identity of the southern Pillar has been disputed through history, with the two most likely candidates being Monte Hacho in Ceuta and Jebel Musa in Morocco. Polat Kaya: So, according to this reference, two natural land formations on either side of the Strait of Gibraltar are named as the two Pillars of Hercules. Namely, one of the Pillars on the European side is said to be the so-called “Rock of Gibraltar”. The one on the North African coast is said to be either a mountain called Mount HACHO which is part of the city called CEUTA or alternatively, the other candidate is said to be the Jebel Musa in Morocco. Hercules is the Roman name for the Greek divine hero Heracles, who was the son of Zeus (Roman equivalent Jupiter) and the mortal Alcmene. In classical mythology, Hercules is famous for his strength and for his numerous far-ranging adventures. With this parental background where the father name ZEUS is the personification of the Turkish word “SÖZ” meaning “words, sayings” and the mother name ALCMENE, when deciphered as “MEN-ACEL”, is the personification of the Turkish saying “MEN AKIL” (MEN BİLGE, MEN BİLGEMİŞ, MEN AGILGAMIŞ, MEN BİLGİ, MEN US) meaning “I am knowledged-man, I am Bilgamesh (i.e., Gilgamesh), I am knowledge, I am wisdom”; and additionally, when the name ALCMENE is rearranged as “ACL-ENEM”, it is the personification of Turkish saying “AKIL ANAM” (BİLGE ANAM) meaning “my knowledge mother, my wise mother”, the name HERCULES – (or Greek HERAKLEUS) is the personification and deification of the concept described by the Turkish saying “ER AKLI, US” meaning “man’s knowledge, man’s wisdom”. Of course, everything manmade on earth has been achieved by the foresight, knowledge, experience and wisdom of men. All mankind has helped to achieve the acumulated common knowledge-base of human achievement. Thus mythical Hercules was such a personification of human knowledge that again mythologically he was asked to go and steal the red-cattle of the Phoenicians the Günhan Turkmans at the site of ancient City of Gades or with the present name of City of Cadiz. “The Rock of Gibraltar (sometimes called by its original Latin name, Calpe,) is a monolithic limestone promontory located in the British overseas territory of Gibraltar, off the southwestern tip of Europe on the Iberian Peninsula. It is 426 m (1,398 ft) high. The Rock is Crown property of the United Kingdom, and borders Spain. Most of the Rock's upper area is covered by a nature reserve, which is home to around 300 Barbary macaques. These macaques, as well as a labyrinthine network of tunnels, attract a large number of tourists each year. The Rock of Gibraltar was one of the Pillars of Hercules and was known to the Romans as Mons Calpe, the other pillar being Mons Abyla or Jebel Musa on the African side of the Strait. In ancient times the two points marked the limit to the known world, a myth originally fostered by the Greeks and the Phoenicians.”. Figure 18. A view of Rock of Gibraltar. Polat Kaya: The name GIBRALTAR is another one of the riddled names. When we decipher GIBRALTAR letter-by-letter as “BILGA-RTAR”, it reveals the Turkish saying “BİLGE ERTUR” meaning “it is the man enlightened with knowledge; it is Bilgamesh Man”. Thus, somehow, the name GIBRALTAR has been secretly identified as a natural monument for “a scholarly man shining like a sun with shining knowledge illuminating others”. Additionally, when the composite name GIBRALTAR is deciphered letter-by-letter as “AR-BILGTAR”, it also reveals the Turkish saying “ER BİLGİDİR” (ER BİLGİTUR) meaning “it is the knowledge of men, it is the enlightenment of men”. The Rock of Gibraltar is a high rising HILL (TEPE in Turkish) which is clearly visible among other hills of the country side. The human head is also called TEPE or BAŞ in Turkish. TEPE is where the knowledge is acquired, thought of, learned and accumulated. An enlightened man who shines like a light at the top of a mountain is also a high rising TEPE with “light”. So, he/she also becomes visible and well known among others. Thus, it is natural that a prominent HILL or MOUNTAIN is named as a monument for human knowledge. The second Pillar of Melqart or Hercules refers to the Carthaginian founded city of CEUTA. The name CEUTA, Figure 19, has a number of Turkish sayings embedded in it such that their meanings are relevant to the identity of the town name. a) The name CEUTA, deciphered as “CEU-TA”, is a form of the Turkish saying “GÖY TAĞ” (GÖK DAĞ) meaning “blue mountain” which would refer to the mountains surrounding the city of CEUTA. One of these mountains is the one named Mount HACHO. b) The name CEUTA, deciphered as “TA-CEU”, is a form of the Turkish saying “TAĞ KÖY” meaning “mountain village” which would be a likely name of this town in Turkish. c) The name CEUTA, deciphered as “CEU-TA”, is a form of the Turkish saying “GÖY ATA” meaning “Sky Father” which would refer to the Sky-God of ancient Turanians. The Carthaginians, being a branch of the Phoenicians, i.e., the Turanian GÜNHANS, were TURKMANS also - contrary to all kinds of disinformation spread about them throughout the ages. Thus, this Turkish saying “GÖY ATA” (GÖYATA) would also identify the city CEUTA as a city named after the Turanian Sky-God concept. These definitions in Turkish are descriptive of the Carthaginian city name CEUTA both mythologically because it is the name of the Sky Father God, and also as a village name in Turkish. The Carthaginians were ancient Turkmans. d) On the Mediterranean Sea (AKDENIZ in Turkish) side of the city of CEUTA, there is a low mountan which is called “Mount HACHO”, see Figure 20 below. The name HACHO, deciphered as “HAC-OH”, is the pure Turkish saying “HAK O” (i.e., TANRI O, ADALET O, KANUN O) meaning “it is right, justice, equity, law; God; truth, true”. This is a very important meaning in Turkish to be given as the name to this mountain. The concept of “JUSTICE and FAIRNESS” is the principal COLUMN that holds a social order in peaceful unity, in an order in which the members of the community love each other and respect each others” rights. Without justice and fairness any system would soon or later collaps into chaos. In this context, the Monte Hacho is said to be one of the “pillars of Hercules”. 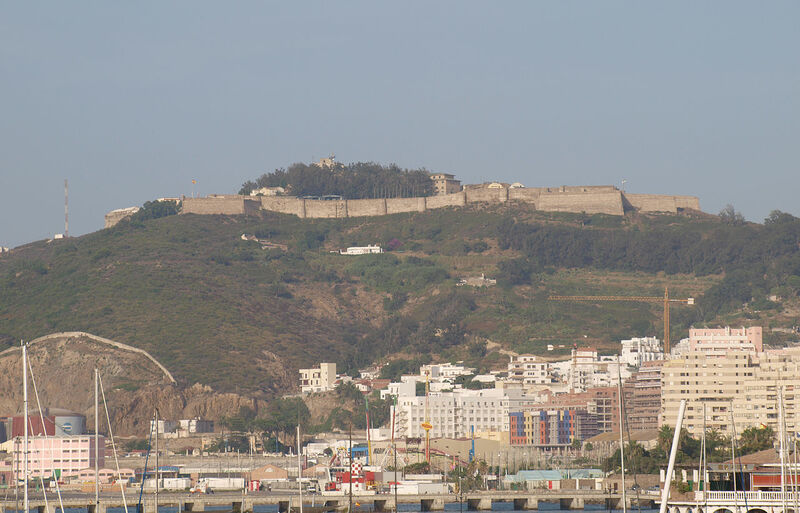 “Monte Hacho” is located on the Península de Almina and topped by a fort, named the Fortaleza de Hacho,. http://en.wikipedia.org/wiki/Monte_Hacho. The F in the name FORTALEZA is most likely a Caesar shift of the letter G. That makes it GORTALEZA. When GORTALEZA HACHO is rearranged as “GALAZETOR HAC-OH”, it reveals the Turkish saying “O HAK GALASIDIR” (O HAK KALESİDİR) meaning “it is a castle of Justice, it is a tower of justice”. In other words, “it is a pillar of fairness conceived by the ancient Turanian GÜNHANS – (so-called Phoenicians and/or Carthaginians) of the Tur/Turk/Oguz peoples”. Figure 20. Mount HACHO and the Fortaleza de Hacho, Ceuta. (O HAK KALESİDİR) meaning “it is a pillar of Justice”. WHAT WAS SAID ABOUT THE PILLARS OF HERCULES OR THE PILLARS OF MELQART? The two Pillars of Melqart or the “Pillars of Hercules” shown on the “Coat of Arms of Cadiz” are labelled with “PLUS” and “VLTRA” - supposedly in Latin. In order to be able to have a meaningful connection between these two labels of the Pillars of Hercules and the name Hercules, and similarly between the Pillars of Tyrian Melqart (Milqartu) and the name Melqart (Milqartu), we need to identify the real identities of Hercules and Melqart (Milqartu). Polat Kaya: The term PILLAR, when read as “P-ILLAR” (where letter P is linguistic wrapping), reveals that the remaining term “ILLAR” is the altered form of the Turkish word “ELLER” meaning the “hands”. Indeed, when we examine our hands, we note that each hand has five upstanding natural “pillars” in the form of fingers of our hands. Thus, the so-called Aryan term “PILLAR” has its source in Turkish and it has been made up from a Turkish word that has been confused and disguised. The Latin name PILARE has the Turkish saying “ER-ELİ” meaning “hand of man” embedded in it. Similarly, the Latin term COLUMNA, deciphered as “COLUNAM”, reveals its source as the Turkish word “KOLUNAM” meaning “I am your arm”. Turkish word KOL means “arm”. Indeed, our arms also are two “columns” or “pillars” that hang down on the two sides of our body. Addtionally, they can hold up our body weight when needed and also can hold up weights that need to be held above our head. When we hold our arms straight up, they not only resemble two pillars but also can be used to lift up and hold some objects. Similarly, our legs are also two columns that hold up our body. The legs of four legged animals are also natural pillars or columns. The four legs of a table are also columns. Thus, the so-called Aryan term “COLUMNA” also has its source in Turkish and has also been made up from a Turkish word KOL or KOLUM that has been confused and disguised. With these definitions, we can now say confidently that terms PILLAR and COLUMNA have been etymologically sourced from the Turkish language. It bears the motto Plus Ultra (Latin for further beyond), encouraging him to ignore the ancient warning, to take risks and go further beyond. Above I noted that there were two pillars labelled as PLUS and ULTRA on the Coat of Arms of Cadiz. In this context, the Latin term PLUS has a Turkish saying embedded in it: when the term PLUS is deciphered as “PULS”, it reveals its source as the altered form of the Turkish saying “BOLUZ” meaning “we are plenty, much, greatly, very; more; most; more, many, too much, more than enough.” The Turkish word “BOL” means “plenty, much, greatly, more, too much, more than enough.” So, the source of this so-called “Latin” term PLUS is none other than the Turkish language contrary to known information about its source. Furthermore, the term BOL, BAL, BAAL, BEL, BIL may also represent the name of the God of the Phoenicians. Furthermore, when the term PLUS is associated with the names HERCULES or the name MELQART, the word PLUS is an altered form of the Turkısh saying “BİLİŞ” which has the meaning of “knowledge, knowing”. To see this difference, fırst we have to know the true identity of the names HERCULES (HERAKLEUS) and even the name MELQART (MILQARTU). Similarly the name MELQART, when deciphered as “AQELMTR”, also reveals its source as the altered form of the Turkish saying “AKILIMDIR” meaning “it is my mind, my knowledge and my wisdom”. Also the name MİLQARTU, deciphered as “AQILUMTR”, also reveals its source as the altered form of the Turkish saying “AKILIMDIR” meaning “it is my mind, my knowledge and my wisdom”. But additionally, the name MİLQARTU, deciphered as “UQILAMTR”, also reveals the Turkish saying “OKULUMDIR” meaning “it is my school, it is where I learn my knowledge and my wisdom”. Thus from all this, we see that the first pillar, labeled as PLUS, of the two Pillars of Hercules or Melqart is a representation of the “knowledge of men”. Knowledge of men is generally obtained by attending schools where one can learn all kinds of subjects in a systematic and controlled way. And, learning enables men to better qualify themselves to progress into new fields of learning and understanding of the environment and to survive under endless adversarial conditions. Phoenician GÜNHANS were well learned people who had schools for all kinds of subjects as they were scientists and artists. This we see when the name PHOENICIANS is deciphered as “OCIAN-PEIHNS”, it reveals the Turkish saying “OKIYAN BEYLERİZ” meaning “we are learned lords”. The Latin term ULTRA also has other important Turkish sayings embedded in it. The name ULTRA deciphered as “AL TUR”, reveals that the term ULTRA is the altered form of the Turkish word “AL TUR” meaning “Red-God Tur”, that is, “ the Sun-God believing Tur/Turk/Oguz people”. But God TUR was the God of all gods and also the God of Justice. Therefore, it is expected that one of the two Melqart pilllars represent “justice” for human beings all over the world. Alternatively, the name ULTRA diciphered as “ATUL-R” is the altered form of the Turkish saying “ADÜL ER” (ADİL ER) meaning the “the just man”. The ancient Turanians are known to be “justice loving people”. After all, their ancestor TUR was known as the God of Gods and also as the “God of Justice”. The name ULTRA deciphered as “TURAL”, reveals that the term ULTRA is also the altered form of the Turkish word “TURALI” (TÖRELİ) meaning “with law; with justice”. With these meanings, the term ULTRA is a personification of justice. The name MILQARTU (MELQART), when deciphered as “AL-TURQIM”, reveals itself as the Turkish saying “AL TÜRKİM” (AL TÜRKÜM”) meaning “I am Al Turk, “I am the sun-red painted Turk”, “I am the Sun-God believing Turk”. This again verifies that the Phoenicians were Turkish peoples - as the Turkmen name identified in Part-7 indicates them to be so. Additionally, when the name MILQARTU (MELQART) is deciphered as “ATIL-RQUM”, it also reveals itself as the Turkish saying “ADİL IRKIM” meaning “I am just race, I am just people.”. Turkish word IRK means: “race”. Furthermore, the name MILQARTU (MELQART), when deciphered as “ATIL-RQUM”, also reveals itself as the Turkish saying “ADİL ERKÜM” meaning “I am just power; I am fair strength; I am just force, energy, potency”. Turkish word ADİL means: “just, equitable, lawful, impartial, even-handed, fair-minded, right-minded, righteous, scrupulous” and ERK means “power, strength, force, energy, potency”. On a related note, there is the presently used Physics term ERG which is a unit of work or energy. It appears that even this term ERG is none other than the old Turkish word ERK as defined just prior. All the textbooks and dictionaries define and explain ERG as coming from the Greek term ERGON. But ERGON has in it the Turkish term GÜN ERI meaning “daily worker”. Turks also use the term IRGAT for “daily worker”. Also, ERGON has in it the Turkish term ERK HAN meaning “force man” or “energetic man”. Thus, in view of these definitions, the God MILQARTU (MELQART) of the “Phoenician” people, that is, the “Günhan Turks” (Turkmen) - was also a personification of the “concept of justice” of the ancient Turanian Tur/Turk/Oğuz peoples. It is not surprising, because the God TUR of the ancient Turanians was the “God of gods and the god of justice” as I have indicated in many previous writings of mine. The name TUR was an ancestral name of Tur/Turk/Oguz peoples. We also see the “justice” concept embedded in the name PHOENICIANS. The name PHOENICIANS , when deciphered as “CANON-PEIISH”, shows that the name has embedded in it the Turkish saying “KANUN BEYİZ” meaning “we are lords of justice, we are lords of law and order”. This again verifies the concepts “ADİL ERKÜM” and “ADİL-IRKIM” that I noted above in the name MILQARTU (MELQART). Fınally, inside the name TUR, that is, the god of justice, there is the Turkish word TÖRE which means “law, order; tradition”. The Turkish word TÖRE has been Semitized as “TORAH” meanıng “law”. With all of these definitions, we find that the second pillar, that is, the one which is marked with the so-called Latin word ULTRA, of the “Pillars of Hercules” or the “Pillars of Melqart” was a representation of the concept of JUSTICE. Thus, the two Pillars of Melqart (or the “Pillars of Hercules”) shown on the “Coat of Arms of Cadiz” labelled with “PLUS” and “VLTRA” actually represent two fundamental noble principles (i.e., KNOWLEDGE and unbiased JUSTICE) necessary for the enlightened and harmonious functioning of any community - as conceived and named by the ancient Turanian Günhans (Phoenicians) of Tur/Turk/Oguz peoples. After revealing these secret meanings of the two Pillars of Melqart – (or Pillars of Hercules), let us turn back once more and see how they were mythologized by Greeks and others. The Pillars of Hercules or the Pillars of Melqart in antiquity were identified with the geographical promontories that flank the entrance to the Strait of Gibraltar. In this definition, the northern Pillar was identified with the Rock of Gibraltar and the second one was tought to be either Monte Hacho in Ceuta or Jebel Musa in Morocco. My geographic identification of the second pillar is the Monte Hacho in Ceuta as I explained above. Representing the concepts of KNOWLEDGE and JUSTICE with two geographical points of distinction without identifying the true meanings of PLUS and ULTRA is rather suspicious. It gives the impression that the true meanings of these two very important and prominent concepts have been suppressed. Either the ancient Greeks, Romans and clergy did not know their true meanings (which I do not believe) or the rulers did not want ordinary people to know the true meanings and implications of PLUS (KNOWLEDGE) and ULTRA (JUSTICE). If people could be kept in ignorance regarding the important benefits of education and justice to all members of a society, then controlling and expoliting them would be easy. While the ancient Turanians were sharing the importance of KNOWLEDGE and JUSTICE to people, other powers of Europe and Middle East, such as clergy and Aryan and Semite states, probably did not want to share education and justice with all members of their community. The children of rich families, by getting an education, would continue to rise to all high levels of the state and thus be in positions to control the public. Yet, ordinary people, having no money to get an education, could only stay with farming the land and providing young people for labour and military service - and subsequently, be controlled and exploited by the rich. In any community, rules and laws are required to provide unbiased justice for all (irrespective of being rich or poor, able or disabled). Without such a justice system, the community will not function in peace or harmony, rather, it would be stressed to the point of chaos. However, there is a hidden reason for identifying the Rock of Gibraltar and Mount Hacho of Ceuta as the two pillars of Melqart. In the case of the name GIBRALTAR, I explained above that the name GIBRALTAR , when deciphered as “AR-BILGTAR”, revealed the Turkish saying “ER BİLGİDİR” meaning “it is the knowledge of man, it is the enlightenment of man”. GIBRALTAR was chosen as one of the Pillars of MELQART, not because it was a great big rock, but rather because it secretly contained the Turkish saying “BİLGİDİR” meaning “it is KNOWLEDGE” - just as the Phoenician term MILQARTU has embedded in it the Turkish saying “BİLGİDİR” meaning “it is KNOWLEDGE” or “İLİMDİR” meaning “it is Science”. The name GIBRALTAR is just another form of the name MILQARTU and was made up from MILQARTU. It is said that the Romans called the Rock of Gibraltar by the name Mount CALPE. This is also interesting to note, because when the name CALPE is deciphered as “PELCA”, it reveals its source as The Turkish saying BILGE meaning “enlightened man, knowledged man; knowledge”. Thus, we see that CALPE is just a rearranged, confused and Aryanized form of the Turkish words BİLGE and BİLGİ. So, even the Roman linguists and clergy knew that the source of the name was from Turkish. Additionally, it is said that the name GIBRALTAR is “the Spanish derivation of the Arabic name Jabal ṬTāriq (جبل طارق), meaning "Mountain of Tariq".” http://en.wikipedia.org/wiki/Gibraltar. Even in this case, the Phoenician name MILQARTU, deciphered as “UL-TARIQM”, reveals the Turkish saying “ULU TARIQ’AM” meaning “I am great Tariq”. This gives a likely reason to attribute the name GIBRALTAR to “Ziyad bin Tariq”. But the name TARIQ is a simple variation of the name TURQ (TURK). The name MILQARTU, when deciphered as “AL-TURQIM”, reveals itself as the Turkish saying “AL TÜRKİM” meaning “I am Al Turk, “I am the sun-red painted Turk”, “I am the Sun-God believing Turk” - again verifying that the Phoenicians were Turkish peoples as the Turkmen name indicates them to be so. From all of this, I find that the name GIBRALTAR is just another concoction designed to hide away the name TURK and to attribute the ancient civilization of Turanian Tur/Turk/Oguz peoples to some unrelated other groups. In other words, the ancient Turanian history has been stolen. I would also like to point out that even the name MOORE of the Moore Empire of Andalucia came from the Turkish word MOR meaning “purple” which was the famed dye that the Phoenician Gunhans recovered from the mollusc named MUREX. Naming Mount HACHO as the second pillar of the Pillars of MILQARTU makes sense because the name HACHO is the Turkish saying “HAK O” meaning “it is justice”. That is why this geographical point was named as a possible candidate as the second pillar of the Pillars of Melqart. We must not forget that HACHO was the name that the Phoenicians themselves gave to this mountain - showing that their language was Turkish. The City of CEUTA, located on the shores of North Africa and separated from the Rock of Gibralter by the Strait of Gibralter, was a city founded by the Carthaginian GÜNHANS. With all of this, I have revealed in great relevant detail, the true meanings of the two Pillars of MELKART labelled as PLUS and ULTRA – which has been kept secret until now.